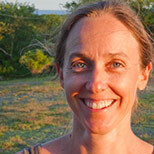 Anne Guerry is chief strategy officer and lead scientist at the Natural Capital Project (a partnership among Stanford University, the University of Minnesota, The Nature Conservancy and World Wildlife Fund) and a senior research associate at the Stanford Woods Institute for the Environment. She sheepishly told a young monk in Laos recently that she’d been to school for 21 years (he figured her brilliant or stupid). She lives in Seattle with her husband and two boys.